S: "I wish I could do want I wanted all the time." Me: "I wish I could do what I wanted to, too? What would you want to do?" S: "I'd want to stay up really, really, really late!" Me: "I'd want to go to bed really, really early!" 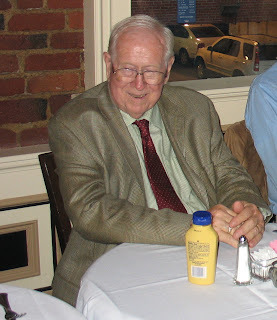 This weekend was one of heavy hearts for us, as we laid my grandfather to rest. If you had asked me a week ago how I would have felt if my grandfather were to pass away, I probably would have told you that it would be mixed feelings. 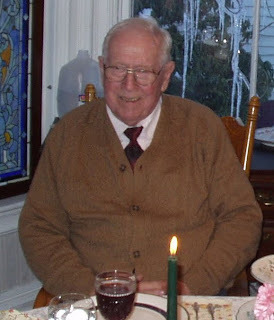 My grandfather had lived a long, and full life of 89 years, but the last few years have not been kind to him as old age laid waste to what was once a very sharp mind. But when his time finally did come earlier this week, the news hit much harder than I would have expected. While I am joyful that he finally has the opportunity to enter into His rest, and to join his wife who passed away nearly 15 years ago, I can't seem to shake a profound sense of sorrow. I'm sad to lose his presense at many of our family gatherings. I'm sad that that generation of my family is now gone. I'm sad that my grandparents' home, which was a place where I experienced a lot of memories from my childhood will be sold, and almost suredly torn down. I'm also very saddened by the indignity of old age. My grandfather won two purple hearts and a bronze star in WWII. He was a small business owner, and later a civic leader as the executive vice president of the chamber of commerce. He was active in his church, and various other organizations. But, these last few years have been very difficult as he was nothing like who he once was. To many of us, losing all knowledge of your family would lead to incredible loneliness. But, I am somewhat comforted in the fact that he always felt so at ease talking with strangers, that hopefully when he sat down with his loved ones in recent years - likely not even knowing who they were - he still felt like he was in the company of friends. So, goodbye, my friend. I know you were always so proud of all your children and grandchildren. I hope you know how proud we all are of you, too. Today we took S and J outside to enjoy the recently fallen snow. J seemed pretty pleased with sitting atop the snow mountain in our front yard. He only lasted about 10 minutes outside though - the wind was so bad and it seemed to take his breath away. S and J rang in the New Year by performing a toy piano duet. It was certainly music to our ears! Gami and Papi came over to help celebrate New Years. We played Wii together and had lots of fun. 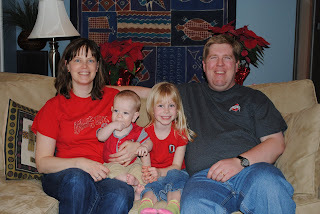 Then it was time to don our Ohio State shirts and watch the Rose Bowl. 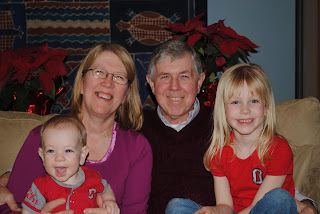 We were thrilled with OSU's victory!